There are lots of accessories out there that you can get for your dog, but getting a dog camera may prove to be beneficial in many ways. But how do you know which dog camera to buy and what features you need? More importantly, how do you choose the right dog camera from all of the models that are currently on the market? Those are the questions that we strive to answer in this buying guide. We will be looking at the main features of dog camera and what you should be looking for when you buy one as well as recommending some specific pet cameras that will help you keep an eye on your pet plus utilize several other features as well. Let’s take a look at the top five dog cameras that are currently on the market. These are considered the best out there, and they contain features that are pretty rare when it comes to this type of product. Each of them has their own disadvantages and advantages, so you will have to decide what you find most important when it comes to buying a pet camera. The first dog camera that we are going to discuss has been designed after input from thousands of vets and trainers, so it has every conceivable feature that you could need from a pet camera. This one is designed specifically for dogs, although it will keep an eye on multiple pets. Some of the features that this dog camera offers include dispensing dog treats. 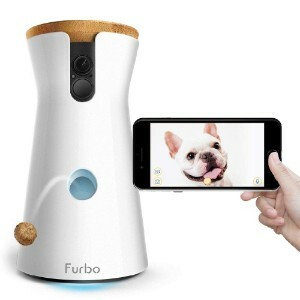 But this device doesn’t just dispense a treat – it actually tosses it to your dog with the totally free Furbo app. You can load up this camera with more than 100 small treats to give to your dog and then remotely access the device to allow them to catch them while you are away. In addition, this dog camera has two way communications with bark alerts. You won’t have to worry about your dog incessantly barking while you are not home or are in another part of the house. Instead, your device will alert you and you can speak directly to your dog to let them know not to bark. You can even adjust the sensitivity of the bark monitor if it is picking up too much or not enough. But the crux of this device is the 1080p HD camera with night vision. It has a 160 degree field of view. Plus, you will be able to detect when your dog is hanging out near the camera hoping to see you. There are some pretty significant reasons why you should have a dog camera. If your dog consumes something that they are not supposed to you may be able to respond in time to save them. That’s entirely possible thanks to the artificial intelligence embedded in this camera that sends out alerts whenever it detects that there may be a problem. You’ll get real time alerts for jumping on furniture, anxiety and lots of other behaviors. This is specifically designed to recognize those behaviors in dogs. 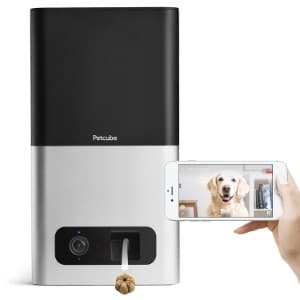 Another terrific camera system on the market for your dog is this Petcube Bites pet camera with treat dispenser. There are lots of things that you will like about this pet camera starting with the fact that it can launch treats at varying distances by your hand or you can schedule automatic treats to be dispensed. In addition, when it comes to dispensing treats, this is one of the most versatile pet camera units on the market allowing for a huge variety of dry and crunchy treats for dogs and cats. There are even some treats included with the unit. Of course, the main thing that you want is a solid camera to keep an eye on your dog while you were out of the house. That’s why this unit has a 1080p HD camera that includes night vision allowing you to stream HD video to your smartphone any time. This unit has a 3X zoom in and it offers 130 degree wide viewing angle. In addition, you not only get to see and hear your pet, but you can also talk to them remotely through the two-way audio system. Plus, whatever sound or motion is detected you get a notification and the ability to see what is going on quickly. You can even save triggered videos for later viewing. If you want to spring for the additional Petcube membership then you get recording to the cloud including access to an interactive video timeline and lots of other benefits to having a membership. You can start with the seven-day trial and then cancel your plan at any time. This is simply one of the best camera systems out there for pets, and it comes with a terrific app. It does require a Wi-Fi connection and it is compatible with any recent Android or iOS device. 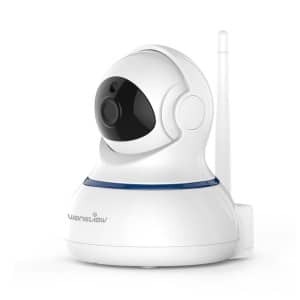 This Pawbo Life is a pet camera with Wi-Fi that not only has a terrific price but it comes with all of the features that you need in almost everything that you would get with a much more expensive unit. Some of the useful features that you get with this unit include 720p HD live video and 130 degrees of viewing. You also get recording of every moment that the machine is active through your mobile device for as much space as you have on your hard drive or SD card. This allows you to monitor your pets in real time and make sure that they are doing okay which will give you peace of mind when you are out of the house. In addition, there are four useful features that you will really love. The first is the microphone that allows you to listen to your pet even if they are not near the camera as well as a speaker so that your pet can hear your own voice. This unit also comes equipped with a laser for you to play with your pet from a distance as well as a treat dispenser to reward them for good behavior or to let them know that you’re still around. You can also share photos on all of the major social media sites so that other people can share in your joy of having a dog. One of the most useful features about this device is the ability to connect several Pawbo devices together so that you can see at different angles around the house. All of those devices will also have the built-in microphone and speaker is the tree dispenser and laser so that you are able to interact with your pet’s room he or she may be in. You can also connect up to eight users simultaneously. The device has an app for Android and Apple devices and requires a simple Wi-Fi connection to work. It is easy to set up, easy to use and you will love getting all of the features of a comprehensive pet monitoring system without having to pay an arm and a leg for it. If you want a high-quality pet monitoring system, then this is definitely one of the top choices out there. You get full 1080p HD with this camera including resolution at 25 frames per second and a reliable stream that can be accessed with all kinds of different devices including both Windows and Mac computers, Apple and android devices and more. This is a quality pet monitoring system that provides you with extremely high resolution video and ultimate compatibility so that you can access your camera feeds no matter where you are or what device you happen to be working on. You can even access through a standard web browser. But there are lots of other things to love about this device as well. For example, has a microSD card slot and supports up to 120 gigabytes, and then videos can be transferred to a computer without even taking it out of the camera. If something happens like your camera getting stolen, you can check the video on your computer and find out who took it. Setting up the mobile apps on android or iOS is easy to do and you can access videos through your normal mobile network. This camera also gives you a great deal of control including being able to pan, tilt and zoom the camera. It provides an amazing 350 degree horizontal view and 76 degree vertical view. You can also zoom in up to four times. There are also several presets which make it easier to see certain things if you are having trouble. This unit also comes with two-way audio and night vision. You can communicate with your pet and have your pet answer back, and you can even check on your pet in the middle of the night when the lights are off; the IR LED works up to 20 feet away from the camera. Plus, this device is completely secure and your personal information will never be available to be accessed by hackers. Another terrific HD camera an all-inclusive pet monitoring system is this one from TENVIS. What is truly amazing about this is that it is our budget model, and the price is so low that you won’t be able to believe it with all of the features that it has been to offer. This system has many of the same features that pet monitoring cameras that sell for hundreds of dollars offer, but it gives you everything you need without breaking the bank. First of all, this is a 720p HD camera with one of the farthest reaching IR lenses out there; allowing you to see in the dark up to 32 feet away from the camera. This camera also is motion activated, capturing video in real time when objects move. This allows you to easily check and see what your dog is doing whenever they pass by the camera. You also get two-way audio communication so that you can talk to your dog and hear your dog talk back, activated automatically with motion detecting and the camera let you see high-risk behaviors or problems as they happen so that you can take action. In addition, you have a stable connection to your Wi-Fi modem or router that is easy to set up and you can easily record videos with your mobile network. This is a high-quality camera system and includes all kinds of features at an amazing price. If you are looking for something simple that is going to do the job no matter what and costs far less than the conventional camera systems out there then this is exactly what you need. While other camera systems may have laser beams or treat dispensers and charge hundreds of dollars for those features, this camera gives you everything you need at a rock-bottom price. A dog camera is one of the best investments that you can make for your pet. When you’re away from home or even in another part of the house where you are not able to see or hear your dog, a dog camera system can give you peace of mind. If you worry about your dog during the day, then it camera system might be the perfect solution. Even if you do not necessarily worry about your dog, it can be fun and educational to see what your dog gets up to while you’re gone. That’s exactly what the best pet camera is set up to do. In this buying guide, we will be looking at pet cameras in great detail – specifically the ones that are designed for dogs. There are a lot of options and features that you can get with a pet camera, and once you understand what they are you will be able to make a better buying decision. Prices range considerably wider for this particular product then for many of the other dog products out there. One reason for that are the features that may or may not be included. There are a lot of extras that you can get with a camera to watch pets at home, so you will have to decide what is important to you and how much you want to spend on the best dog monitor. There are some features to consider when it comes to choosing a dog camera. Just like choosing any other accessory for your dog like an automatic dog feeder, outdoor dog kennel or electronic dog door, these best indoor camera for pets have their own features that you need to evaluate. Let’s take a look at some of the features out there available on dog camera systems. First, let’s discuss the viewing angle. The viewing angle is an important consideration when it comes to monitoring your dog because you want to be able to see is much as possible and that means having a wide view of the room in question where the camera set up. You may have a dog gate that keeps your dog from going upstairs or getting into a room where you do not want him or her, or you may have the dog camera trained on their dog bed, dog playpen or dog crate. You may even have the camera located next to their dog bowl or dog food container so that you can see that your dog is eating and staying healthy. The wider the angle you have, the better the information that you are going to get. You also should be looking at the video resolution of the camera device. Some cameras out there offer standard video resolution like 480p while others offer high definition video resolution like 720p and 1080p. Just like with anything else that you buy for your dog like a dog stroller, dog car seat cover, dog seatbelt or dog bike trailers, it is all about how effective the product is. Having a camera system set up will not do you any good unless you get high enough resolution so that you can see what is going on in your home when you’re not there. That’s why video resolution is one of the most important factors to look at. If your dog camera has an intercom system, it allows you to communicate with your dog whether he or she is behaving badly or not. Whether you want your dog to go to their dog house or you want a replacement for something like anti-chew dog spray, being able to communicate with your pet when they are behaving badly is key. But intercom systems can also help you connect with your dog when their behavior isn’t bad. If your dog is experiencing anxiety, hearing your voice may give them some comfort in allow them to get through the time remaining until you get home without resorting to destructive behaviors. You might also want to have a video intercom system for the best Wi-Fi pet camera you can get. A video intercom system allows you to communicate with your dog on a higher level. If your dog can see your face, then anxiety is reduced and they are much less likely to exhibit bad behaviors because they think that you are nearby. This also allows you to bond with your dog even when out of the house. For people that work a great deal and are not able to spend as much time with their dog as they would like, this is an amazing solution. Not all of the camera systems out there come with video monitoring on both ends, but most of them come with video monitoring on a least one. If you want to observe your dog at night, then you’re going to need a night vision camera. The thing that you have to remember about a night vision camera is that you are only able to view a certain area. Night vision cameras use infrared in order to illuminate the night, and you have to look at the specifications to determine how far that IR is going to extend. A common example of a dog camera with infrared is 20 feet. That means that the IR light is going to illuminate anything within 20 feet of the cameras for you. This can be really useful though for those who work nights or want to check on their pet while they are in bed. You may also want sound and movement monitoring. There are actually a huge number of options when it comes to monitoring because some camera systems simply allow you to access the feed whenever you choose, while others will alert you when your dog is barking, getting on the furniture or performing some other behavior that you need to correct right away. This can be extremely useful for pet owners who worry about their dogs because you are able to see a problem right when it happens. The app will notify you that there may be a problem in you are able to access the feed and find out if that is the case. There are three types of memory storage options that you have when it comes to the video that you get from your pet camera. Let’s look at each of these three options in detail so that you can choose the best one for your needs and make sure that the camera system that you get has that particular option available. Internal Flash Memory: Flash memory is basically the internal hard drive of your camera system. Flash memory usually does not have that much space in which to store videos, but it is a quick way to store something for later viewing. Often, cameras that store videos and flash storage will make those videos available for download to your smartphone the benefit of this is that you are able to view recent videos that have been saved even if you do not necessarily have a signal when you try to login with your phone. SD Card: An SD card slot on a camera provides lots of storage space for you to take video of your dog and review it later. SD storage is sort of like a flash storage in that your camera system saves the video automatically to an internal hard drive, but the SD card can be removed and placed into another device for easy transfer or you can access it online. Normally, pet camera systems use mini SD cards but some of them still use the full-size version. Cloud Storage: Cloud storage has major advantages as well along with some disadvantages. Although videos are not saved to cloud storage as quickly or as easily, you are able to store pretty much as much video as you want in cloud storage and you can access it from anywhere else through a variety of devices. Cloud storage allows you to watch videos taken by your camera system from any device far away and saves those videos for as long as you might need them. The app that you use to access your camera system is also an important consideration. Most of the apps out there are pretty great, but there are some that are either too complicated or do not provide enough features for them to be usable with your camera system. If you are going to pay hundreds of dollars for comprehensive camera system that monitors your pet, then you are going to want to get an app that allows you to access all of the various features that they camera system provides. You will have to do your own research and determine whether or not the app that you access the camera system with has everything that you need and is going to be usable with your specific camera system. Whether or not your camera system is Wi-Fi capable is another feature that you have to look at. For most of the features that we have discussed so far, Wi-Fi is a necessity. Having your camera system connected to Wi-Fi allows you to view the video feed in real time. 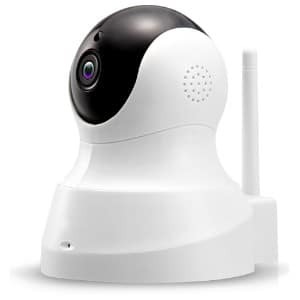 If your camera system is not connected to Wi-Fi, then the only options are going to be to save video to the flash memory or to the SD card that is attached to the device so that you can view them at a later time. This does not help you keep an eye on your pet at all, and your camera system functions more like a trap camera than anything else. You want to make sure that whatever camera system you choose does have Wi-Fi capabilities. There might also be some advanced features that you want to consider when it comes to choosing the right camera system. Let’s look at three of the most important advanced features out there. Advanced Movement Controls: One of the more advanced features that the best home camera for pets provides is advanced movement controls. Advanced movement controls mean that you are able to move the camera and a variety of ways in order to get the best picture possible. For example, you may be able to tilt the camera up and down to see what is going on farther away or closer to the camera. You also want to be able to pan the camera from left to right so you can see the entire room. Finally, you want to be able to zoom the camera in so that you can see what is happening from far away without it being a blur. This is especially important because you are looking at the camera feed on a small screen via some kind of mobile device like a smartphone. Interactive Toys: You may also want to consider whether your camera system has interactive toys for your pets to play with. A common one is a laser pointer that you can control with your app. This is probably more appropriate for cats than it is for dogs, but dogs can still appreciate playtime, especially when you are the one that is playing with them. Owner-Assisted Feeding: You may also want to look into owner -assisted feeding or treat projection. If you can give your dog a treat when they exhibit good behavior, even if you are all the way across the city, then you are going to have a much easier time bonding with your dog. For example, you can train your dog to respond to vocal commands using nothing more than the audio feed on your camera system and treat dispensing. It could also be beneficial for you to be able to provide your dog with the treat for no reason at all when you are bonding with them via the intercom system. The bottom line is there plenty of things to consider when it comes to choosing the right camera system. You have to figure out what is going to be most important to you and make your decision based upon that. Some of the features that camera systems provide have been listed here, but that is by no means a final list. There are other features out there that you may want to look at as well. The most important thing is that you prioritize what to look for first, whether that is price, viewing angle, ease-of-use or some other factor. If you can prioritize what you need above what you want, then you have a much better chance of choosing a camera system that comes in under budget and getting everything that you need in a pet monitoring system to give you the peace of mind that you desire.